Posted on Wed, Mar 21, 2012 : 8:46 p.m. The Washtenaw County Board of Commissioners voted Wednesday night to establish a $500,000 disaster relief fund in response to last week's tornado. The county plans to use the money to provide continued assistance to residents impacted by the storm that left dozens of houses in the Dexter area in ruins. "Despite the fact that citizens themselves emerged unscathed, property damage was extensive," County Administrator Verna McDaniel wrote in a memo to the board. "Nearly 20 homes were completely destroyed, and almost 200 more were badly damaged. There are always going to be needs in these situations that governmental entities must meet." Dexter Township Supervisor Pat Kelly and state Rep. Mark Ouimet, R-Scio Township, appeared before commissioners Wednesday to talk about the county's response to the disaster. McDaniel said the county's capital reserves will be drawn down by an amount of up to $500,000 for the effort, depending on the community need during the cleanup and restoration. In wake of the disaster, the county has been working with Dexter Township and Dexter Village to put a joint website in place with the dual purpose of informing citizens of the most up-to-date information and volunteer recruitment. In addition, the Sheriff’s Office — which includes the Emergency Operations Center — County Parks and the county's administration have taken steps to ensure a safe environment that allows workers to continue cleanup. McDaniel said the tornado that touched down in Dexter left a path of destruction and created a need for security and emergency services, as well as cleanup and waste disposal services. The county has actively been involved in each of those efforts. Nine dumpsters have been provided through a subcontractor and will be needed for some time as building debris cannot be dumped in the Chelsea landfill, McDaniel said. Sheriff’s Office employees have been working on overtime to ensure the disaster area is safe for workers and homeowners. McDaniel said the disaster relief fund, approved by a 9-0 vote with two commissioners absent, will pay for those overtime hours. The relief fund also provides the county with the necessary resources to hire contractors to remove debris and continue disposing waste not allowed in the Chelsea landfill. Commissioner Rob Turner, R-Chelsea, was given credit Wednesday night for his leadership in marshaling resources and working with Dexter officials to coordinate county resources. Dexter Township Supervisor Pat Kelly and state Rep. Mark Ouimet, R-Scio Township, appeared before commissioners to talk about the county's response to the disaster. They all agreed the county's employees should be commended. "I think it's important that you all know what a great job your county employees have done. It was spectacular," said Ouimet, a former Washtenaw County commissioner. "They were controlling traffic, which I think was exceedingly well done, and they went house to house where the tornado hit making sure everybody was accounted for," Ouimet said. "I think Jerry Clayton and his troops deserve a real positive stroke on the back for what they did, and those guys worked tirelessly around the clock for many days to do this." "I did want to come here to let this whole board know how much my township and all of us out there appreciate everything that has happened these last five days," Kelly said. "This county should be damn proud of themselves today." 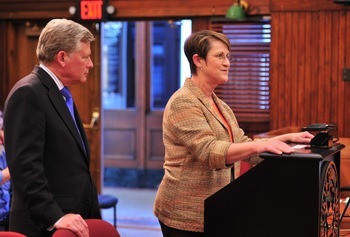 "Personally I am very proud of Washtenaw County," said Commissioner Leah Gunn, D-Ann Arbor, giving special recognition to the Sheriff's Office and emergency management. McDaniel said the public was notified of the storm last Thursday more than 20 minutes before the tornado struck, and residents sought appropriate shelter. Ouimet is working on writing a bill that, if passed, would provide some state assistance to cover overtime and other costs for police, fire and public works employees, as well as any infrastructure costs incurred by local governments during disasters. I hope the efforts will go beyond just this incident and the county and city officials with the onset of Tornado season starting in a few weeks will review the disaster plans they have developed thus far. for instance if this same tornado had hit downtown Ann Arbor or the downtown Ypsilanti would the response be the same. who would respond and how. where would funding come from to pay for what was needed. lets look at the plans now and maybe conduct an exercise to see if it would really work before it is needed. The same goes for the families in our communities do we have a plan for the lost of our resources. Thu, Mar 22, 2012 : 12:17 p.m. I am happy to see some of my tax money go for county residents help. Thu, Mar 22, 2012 : 10:31 a.m.
Would this also cover the flooding in Ann Arbor, the apartments in Park Place and others? What about any efforts made to prevent Malletts Creek from flooding again, as it did last week and two years ago? Thu, Mar 22, 2012 : 3:30 a.m. I am confused - the county oks $500K but &quot;Ouimet is working on writing a bill that, if passed, would provide some state assistance to cover overtime and other costs for police, fire and public works employees, as well as any infrastructure costs incurred by local governments during disasters.&quot; Why does this bill need to be passed if the county just antied up to pay for the same costs? No one has said that $500K is not enough (or too much for that matter) so why does the state need to step in? Thu, Mar 22, 2012 : 12:47 p.m. While I may agree (or not) with you assessment of the costs its irrelevant since we have not been given estimates by local agencies. It sounds harsh but a disaster is not an open cash register or money grab. If extra monies are needed, fine, but until then passing STATE bills with out spending structures in places seems premature. Thu, Mar 22, 2012 : 11:36 a.m.
Based on the extent of the damages, I would be shocked if you could get this cleaned up for anywhere near $500,000. The number of people (police, fire, etc) who have worked to date is tremendous and I am sure they went well into overtime. My guess is that the tree hauling and shredding from just the Dexter-Pinckney Road and neighborhood area will take most of the summer. You'd have to see to believe how much was destroyed. I worked on just cleaning up one family's yard, only one, with about 40-50 other people both Saturday and Sunday and that yard wasn't done when we left. Thu, Mar 22, 2012 : 1:16 a.m.
&quot;Washtenaw County Board of Commissioners voted Wednesday night to establish a $500,000 disaster relief fund &quot; cool. good stuff.